Product Description: The TMA10A is ideal for HVAC/R technicians measuring Heat/Ventilation/ Air conditioning/Refrigeration wind flow and temperature in residential, commercial and industrial air conditioning systems. It offers numerous functions use it to check air velocity FPM (Feet per minute), air volume (flow) CFM (Cubic feet per minute) plus the remote vane allows greater measurement location flexibility. Switch between degrees C and degrees F. Input the area of airflow measurement to gain accurate air velocity results. Measure an air flow source for a continuous moving average for up to two hours. 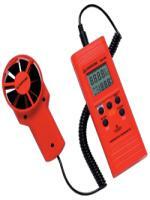 Determine minimum, maximum and average readings from a single point air source.